Cranberries are harvested in New Jersey. USDA photo by Keith Weller. Bruce Goldstein from Farmworker Justice in conversation with Lake Effect's Joy Powers. Farmworkers in the U.S. face unique challenges, complicated by a lack of workplace protections and immigration status that makes it difficult to hold employers accountable. Combined with amplified threats of deportation, many farm laborers are finding their jobs increasingly more difficult. "They are not protected by the same wage protections or occupational, safety, and health protections and other legal requirements that most other workers enjoy in this country." "The labor laws generally discriminate against farmworkers, so they are not protected by the same wage protections or occupational, safety, and health protections and other legal requirements that most other workers enjoy in this country," says Bruce Goldstein, president of Farmworker Justice, an organization that works to improve conditions for farm laborers in the U.S.
Goldstein admits there aren't very good statistics on U.S. farmworkers, but estimates show the majority are immigrants, some of whom are in the country on work visas and others who are undocumented. "We believe that there are about 2.5 million farmworkers in the country - not including their family members - and statistics suggest that at least 70% of them are immigrants, although many people believe it's probably higher at say 80-85% being foreign born," he says. Of those, at least 50% are thought to be undocumented, and he says some believe the number could be around 55-70%. Goldstein says there's a long history of immigrants coming to the United States and working on farms, something many farmers have relied on as a source of willing laborers. 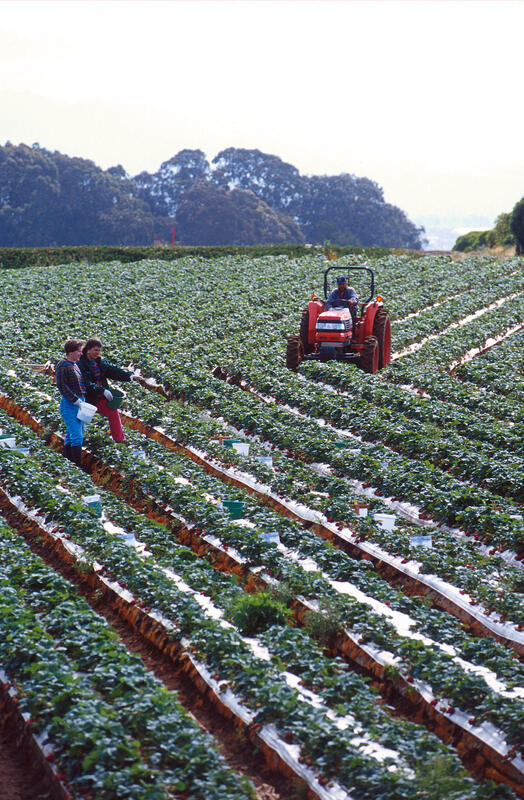 As immigration laws have changed and the process of gaining citizenship has become more difficult, the agricultural industry's reliance on immigrant workers has increased. The issue has created a patchwork of both undocumented workers and so-called "guest workers" who utilize H2-A visas to work on U.S. farms. "There's a special program for agriculture. It's called the H2-A Temporary Foreign Agriculture Worker Program... and under it the worker can be brought in by an employer, but the worker may only work for the one employer that got them the visa, the job is seasonal, and the worker must leave the United States when the job ends," says Goldstein. He continues,"If the worker would like to come back in a following season, the worker has to hope that the employer will invite the person back and apply for a visa for that person." Goldstein says this makes guest workers "reluctant to challenge unfair or illegal conduct," since it could result in both firing and deportation. And unlike foreign born farmworkers from previous generations, workers using H2-A visas aren't given a path to citizenship. "No matter how many seasons these workers return to the United States to help our food system prosper, they are not given an opportunity to earn a permanent immigration status or citizenship." "No matter how many seasons these workers return to the United States to help our food system prosper, they are not given an opportunity to earn a permanent immigration status or citizenship," he explains. Currently there is no cap on the number of H2-A visas agricultural businesses can attain, and proposed changes to the program would weaken workplace protections and reduce government oversight. "We're very concerned because we believe that the abuses under the H2-A program of workers is so rampant that protections should be strengthened and enforcement of those protections should be strengthened," says Goldstein. The threat of deportation also looms heavy over U.S. farm fields. "There have been farmworkers who have been arrested and deported. A lot of farmworkers around the country - and their employers - are saying that they see a greater presence of immigration agents in rural communities and it's interfering with their lives and it's interfering with the ability of businesses to plan their future," he says. "A lot of farmworkers around the country - and their employers - are saying that they see a greater presence of immigration agents in rural communities." Many farmworkers have expressed concerns over going to public places, including hospitals and schools, for fear of deportation. Some communities have seen crops go to rot as more and more workers leave the fields. The proposed RAISE Act would also impact farmworkers' ability to gain citizenship because of increased education and language requirements. Under the point system created by the RAISE Act, most immigrants would need advanced degrees, be fluent in English, and have a high-paying job offer in the United States. Most farm laborers would not be eligible for citizenship under these new restrictions, and it would make it more difficult for their families to emigrate as well. "We need a lot of workers in this country who don't have those levels of education and skills, and we need them for jobs that don't require that level of skill and education and language ability," says Goldstein. "So the RAISE Act is really misguided. It also would slash the number of visas available for family members to enter the country and it's very anti-family... at least half the farmworkers in the country today are parents." There’s a local youth agriculture program that has goals bigger than getting kids into farming. Milwaukee native Nick DeMarsh founded Young Farmers MKE with the intent to encourage participants to make goals and plans for the future - farming just seemed to be the perfect medium to get there. Earlier this summer, the owners of a longtime staple on the Wisconsin produce scene announced they will shut their doors for good at the end of September. Brennan’s Markets was founded 75 years ago and operates five stores around Wisconsin, including in Brookfield and Oconomowoc. The tang of a freshly picked tomato, the crunch and sweetness of a recently harvested carrot, the crisp floral flavor of a just-picked cucumber. Chef Dave Swanson wants to facilitate restaurant-goers' ability to taste these items, and pretty much anything else that can be produced or foraged in Wisconsin. Molecular biologist Michael Schläppi experimented with rice varieties from around the globe for five years - testing how they stood up to Wisconsin weather in miniature paddies he built on his rooftop lab on campus. He settled on a short-grain variety from Russia. Two years ago, he took the experiment to a farm field outside Port Washington.